Remember your adventure with a Katy Trail shirt, sticker, or patch! 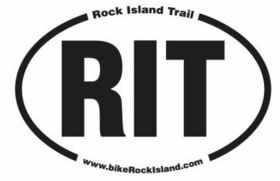 We also have fully laminated Katy Trail maps, and Rock Island Trail stickers! For every shirt you buy, get a Katy Trail map for only $1 (regularly $6.95) and/or Katy Trail sticker for only $1 (regularly $1.95). Discount automatically applied. 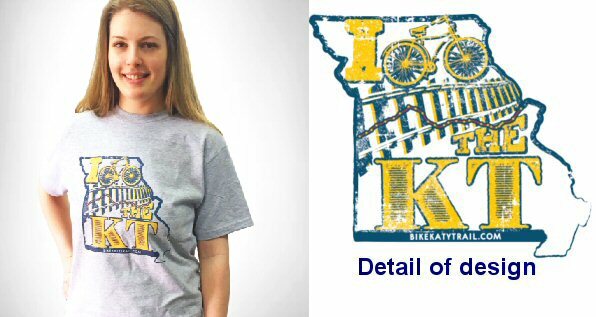 Tell the world "I [bike] the KT" with this 100% cotton ash grey short sleeve t-shirt, featuring an outline of the Katy Trail and state of Missouri with the "I Bike the KT" message. Click the image at right for closer view. Special offer: for each shirt you buy, get a map and/or any sticker for just $1. This all-weather fully laminated map folds up to 6 3/8 X 3 3/4 inches to easily fit in your jersey pocket, and expands out to 25 inches wide when unfolded. One side has a trail map with mile markers, and the other side has a mileage chart, town service information, and other useful trail information. Special offer: get a map for just $1 with each t-shirt you buy. This quality embroidered patch recalls the Katy Trail's original history as the route of the MKT Railroad. After the railroad abandoned this route, Missouri turned it into America's longest rail-trail. The trains are just a memory, but their spirit lives on. Slap a Katy Trail sticker on your car (or any other smooth surface). 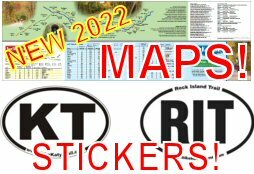 Made of the highest quality bumper sticker materials and inks, this durable oval-shaped sticker tells the world about your Katy Trail connection. Four inches high by six inches wide. Special offer: get a sticker for just $1 with each t-shirt you buy. If you did the whole Katy Trail - all 237 miles - you have every right to brag. This bumper sticker decal memorializes that awesome distance. Made of the highest quality bumper sticker materials. Marathoners have their "26.1" stickers, so cyclists should be able to display "100" stickers after completing a 100-mile century ride. Made of the highest quality bumper sticker materials. Remember a 62.1-mile (100 km) metric century ride with this oval decal. Great accomplishments should be commemorated! Made of the highest quality bumper sticker materials. Help spread the word about this exciting new trail development, which intersects the Katy Trail at Windsor. Made of the highest quality bumper sticker materials.